Human beings have always been fascinated with robotics, and it has been the basis of many science fiction movies. It seems to have recently recaptured the imaginations of the greatest fiction directors, and who knows, maybe in 10 years there will be humanoids as realistic as the “replicants” in Blade Runner. The world of robotics is exploding, and Google’s December 13 purchase of Boston Dynamics seems to indicate that it will be a key sector for the next few years. According to the New York Times, the first automated models will be designed for manufacturers and professionals, and it doesn’t anticipate that there will be personal robots for a few years yet. Other projects, however, are more focussed on individuals, like the Poppy Humanoid project. They manufacture a small humanoid robot that is 85cm tall, and is completely open source and designed for research, education and art. Poppy is a group of people united in the goal to make robotics accessible to everyone, not just the scientific community. The goal is to make modular parts and open source know-how available, enabling anyone to pursue their passion for robotics by building their own robot, whether they are students as part of a school program, artists or individuals. The parts are designed to be assembled in different ways and put together as the user desires, just like Lego. Like any community, the goal is to unite a large number of enthusiasts in the field so that they may share their knowledge and help each other with their projects, while providing the development team with new ideas to make the project advance. Robotics is undoubtedly one of the primary technologies facing the significant challenges of integrating electronics within a complex mechanical structure. 3D printing has become a very useful solution to tackle these problems. When a prototype is designed, several iterations are often required in order to find a suitable part design. 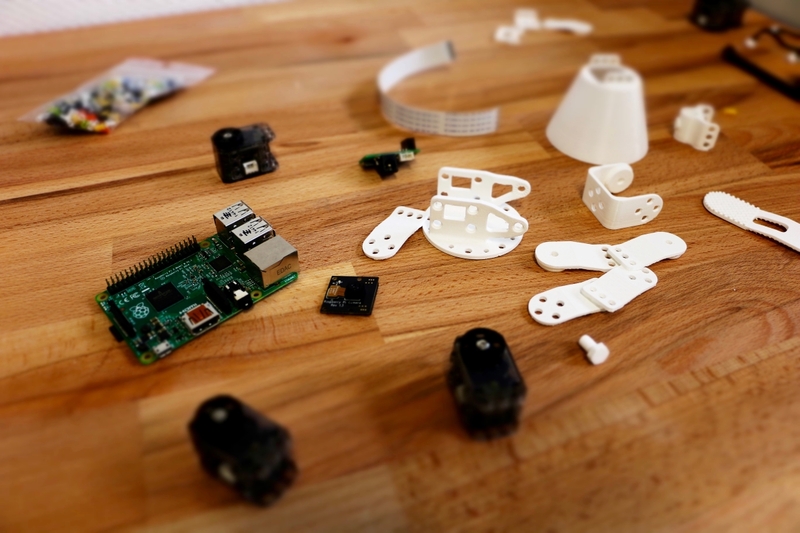 If the prototype also contains electronic parts, it becomes almost impossible to design a working version the first time around, and the “trial and error” iterative method helps tackle the problems one by one. 3D printing’s major benefit is that you can make modifications directly on the 3D file and order the part, which requires minimal reprocessing and is much quicker than other methods. Machining, for example, would require that all of the machining equipment be reprogrammed. As an example, the Poppy team wanted to figure out the ideal angle for the robot’s tibia, and was able to conduct a series of experiments on the part in question by printing two kinds of parts: perfectly straight tibias, and tibias that were at a 6° angle from vertical. By simply modifying the CAD file, they were able to improve their robot’s stability by 30%. One of the major challenges in robotics, and more specifically in humanoid robotics, is the weight of parts. Consider that a lighter skeleton requires less powerful, lightweight motors, which then require more compact batteries. Many materials are both lightweight and strong, but most of them, like carbon fibre, are expensive. Poppy chose a simple, elegant solution by using a white plastic (polyamide) frame printed by laser sintering (SLS). The robot’s crane-like structure would be extremely complex to create with another process and would not replicate 3D printing’s huge advantage of being able to print “in on piece”. If this part were manufactured in two pieces, for example, the connecting points would be frail. A project’s prototyping phase is traditionally separated from its production phase because the methods used differ greatly. Imagine designing a kitchen utensil. The prototype could be made from wood, for example, but during the production phase you would need to create a mold and potentially rework the part when it comes out. 3D printing eliminates these steps, because everything that can be done in prototyping can be done in small series, and at a lower cost, when the 3D printing service can manage the whole printing volume. Your team can therefore continue to produce the robot’s next iterations while allowing customers to get the first functional versions. If you’re interested in getting in touch with us for more feedback on your robotic project, feel free to contact us or consult our dedicated page.